Much publicity surrounded the visit of President Cyril Ramaphosa to the Muslim Community of Rylands in Cape Town to celebrate an evening meal – Ifthar – the breaking of the daily fast during Ramadan. As usual the president is smiling broadly for the press: the dinner was one in a string of widely-publicised presidential visits to various functions and meetings throughout the country since he became president. Did the president talk about crime during his Ifthar visit? Did he discuss what his government is doing about it? And what about the collapse of the country’s municipalities, another problem which would affect the residents of Rylands and indeed all cities and towns throughout South Africa. Local government is the ANC’s Achilles Heel. It is indeed the elephant in the room. Its problems are so intractable that it will be virtually impossible for the country to ever claw back to the previous government’s municipal efficiency. Nobody really knows what South Africa’s population figure is. It seems to go up arbitrarily, according to who is discussing it. At latest count it was 57 million. Migrants are everywhere – from Cameroon, Uganda, Nigeria, Burundi, the DR Congo, Ghana, Pakistan and of course Zimbabwe. Mozambicans simply cross through the Kruger Park’s since the border between the two countries was abandoned. These people throng to this country’s cities, and they utilise municipal facilities for which of course they don’t pay. Where do they live? Where do they work? Who keeps tabs on them? The African Union supports “free borders” in Africa, and president Ramaphosa upholds that policy. (Rapport 3/6/18). Municipal structures are crumbling. Sanitation is non-existent in many areas. In one example, a cemetery in the West Rand has been closed because soil pollution from a neighbouring squatter camp has seeped into the graves. Citizens are advised to cremate their loved ones as no one knows what area of South Africa’s soil will be polluted next! 150 megaliters of sewage is flowing daily into the Rietspruit river because unemployed people blocked the entrance to the sewage plant. They demanded jobs! The police were called but there was no indication that they actually arrived. 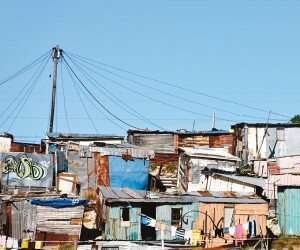 Government promises that by 2014 all squatter camps and informal settlements would disappear have come to naught. Since 1991 informal settlements have increased from 1,9 milion to 2,2 million Around 7 million people live in these places. Because the ANC promised free houses during pre-election canvassing, waiting lists for houses get longer by the day. Although the government has provided three million free houses since coming to power, the growing population numbers simply swamp these efforts. Everybody wants the free goodies promised, and when they don’t arrive, anarchy takes over. Urban areas take the strain: 80% of South Africa’s economic activity occurs in urban areas. 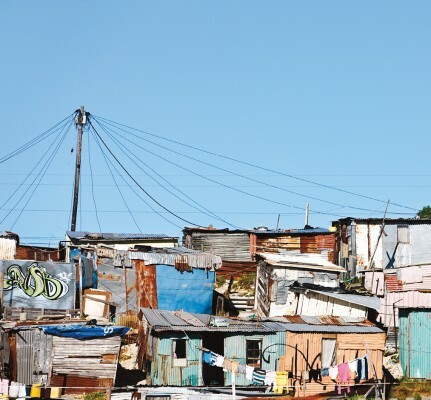 According to Statistics SA, 55% of black people in South Africa live below the poverty line. Youth unemployment is more than 50%. In the former homelands, 65% of the population live on welfare. Government policies are the cause of this inundation. There is little if any control at South Africa’s borders. The “free everything” promises are unsustainable. Local government is broke. Of SA’s 257 municipalities, only 13% are in full compliance with legal requirements, producing quality financial statements and performance reports. Auditor General Kimi Makwetu says 31% of SA’s municipalities are not financially viable. Reasons given are “lack of appropriate financial and management skills”, plus a failure to fill key personnel positions. But the government does nothing about this. Municipalities are still stating their affirmative action policies in job advertisements, which is ANC-speak for no whites need apply. So the public gets what it deserves as it continues to vote for the ANC. Corruption is rife. Mr. Ramaphosa says he will “root it out”. We’ll see! Durban mayor Zandile Gumede is presently under investigation for money laundering, fraud and corruption. The mayor of Endumeni local council was arrested in northern Kwa Zulu at the end of May this year after the Hawks foiled an alleged plot to assassinate the speaker of the municipality. The mayor appeared in the Estcourt magistrate’s court on a charge of conspiracy to commit murder. Auditor general Makwetu’s report revealed that at 215 municipalities R28.37billion was “irregular” expenditure, at 161 municipalities R12.603 billion was “unauthorised” expenditure and at 204 municipalities R1,52 billion was identified as “fruitless and wasteful” expenditure. Mr. Makwetu says the country’s municipal problems are “exacerbated by a repeated failure by leaders to act on his office’s ‘insistent’ advice”. The sheriff recently attached computers and sundry office equipment at the Emfuleni municipality’s offices because of unpaid bills. Rubbish removal has stopped because vehicles are either broken or have been put to pasture. Fifteen years ago this same municipality had 45 rubbish removal vehicles, all in good order. Fifty-three municipalities received qualified audits because their information was incomplete. Mr. Makwetu’s office could not audit procurement processes valued at more than R1,2 billion because documentation was incomplete. Inaction by leaders has created a culture of “no consequences”, says Makwetu. The Treasury and the SA Local Government Association are “working to improve municipal financial management”, says Cooperation and Traditional Affairs Minister Zweli Mkhize. This statement was followed by a long list of how his department was “strengthening” this and “improving” that. But unless the staff structure is changed, there will be more of the same. Mr. Ramaphosa can do nothing about this because he will not upset the municipal staff apple cart now that there is an election next year. In the meantime violence rocks the land. Service delivery protests are a virtual everyday occurrence. Extravagant ANC promises are now albatrosses around their necks. There is no money to fund any of the promises because much of these funds have been stolen by the ANC’s political appointees masquerading as civil servants. Mr. Ramaphosa now finds himself in exactly the same position as ex-president Jacob Zuma. When matters get too hot, the blame game starts. In a speech last year, Mr. Zuma said “the whites have made you poor” to a cheering crowd. He spoke in Zulu. Mr. Ramaphosa is on the same tack. At the Ifhtar dinner in Cape Town, he waxed lyrical about the legacy of Nelson Mandela, and how apartheid and colonialism were the cause of the country’s current malaise. If this humbug is what the ANC’s audiences believe, then there’s little hope that any intelligent assessment will be brought to bear to vote out the ANC at the next election. More than 18 million welfare recipients vote for the ANC no matter what, just so they can collect their cash at the end of the month. Mr. Ramaphosa told voters in his constituency in Limpopo that “the boere will come and get you”. This is the level of political discourse in this country. How to rise above it is Mr. Ramaphosa’s responsibility and indeed his duty. But many voters are not holding their breath until this happens. The views and opinions expressed in this article are solely those of the original author.